CLARKSVILLE, Tenn. (AP) — “Ari, do you want to go cheerlead?” his teammate teased as the two walked across the sideline from the halftime huddle. Football has historically been a male-dominated sport, but that hasn’t dissuaded an increasing number of nontraditional players across the country from joining the huddles. Clarksville is no exception. In the military city where Sundays are filled with church and football, there were at least three middle school football players, born female, who just completed their season. Ari, 14, uses male pronouns at Richview Middle School and in public. As the starting cornerback, Ari felt more masculine, and the opportunity allowed him to express his gender identity. Madisen Bryant, 13, was the starting nose guard for the Clarksville Academy-affiliated team in the Jr. Pro league and requested to be referred to with gender-neutral pronouns, such as “they,” in this article. Elizabeth Cundiff, 13, was a female player on the Clarksville Academy team. She played a number of positions on the field and says she has been targeted for being a girl. Under the fluorescent lights of the Clarksville Academy practice field, a male teammate told Elizabeth he doesn’t want to hit a girl. The coach responded by making the player run laps, but Elizabeth didn’t miss a beat, promptly caught the pitch and was tackled by the next kid in line. Only a few yards away, Madisen was completing tackling drills with the other lineman, facing any player who came their way. Standing at 5-foot, they hit low and knocked opponents off balance. This was Madisen’s first year playing football after being recruited by Elizabeth in her personal quest for more nontraditional players on the CA team. The three don’t see themselves as having done anything too special. They just played a sport they love — with uncomfortable helmets. Ari’s was too big. Elizabeth’s dug into the back of her head. Madisen’s was too tight. In the Clarksville Jr. Pro Football league, sometimes one girl, maybe more, plays each year in the middle school level, according to New Providence and Kenwood Area Coordinator Scott Parker. However, in younger levels there are more girls playing. “It gives every kid the opportunity to play football,” Parker said. There are no requirements for players joining the team other than proof of age and the desire to play. The presence of nontraditional players is likely to increase, some say. This was Elizabeth’s third year playing football. She has played a variety of positions and was a starter on her last team, where she made tackles that no one else could. Playing for the Clarksville Academy team, however, she was often only put in the game when they were up by some 40 points. Elizabeth felt she wasn’t put in the positions she’s good at and wants to play. People have told her the only way she will play in high school is as a kicker. Playing in the middle school league as eighth graders, all three of the players are comparable in size to their teammates. They blend in with the seventh and eighth grade players as they run across the field. Safety worried many football parents of all levels, including Ari’s, Elizabeth’s and Madisen’s as their children took the field every Thursday night. Elizabeth’s older brother also plays football. Freeman said she worries just as much for her son’s safety. Even with safety precautions and helmets, Madisen still took a bad hit that knocked them down and caused a mild concussion on eighth grade night. Ari’s mother, Gail Grimes, sometimes wished her child was a kicker so he wouldn’t get hurt — but Ari enjoyed new bruises and scars from the games. In spite of the injuries and concerns by their parents, for Madisen, Ari and Elizabeth, tackling is the best part of the sport. In practice, the other players often went harder on Ari because he didn’t back down. At the beginning of the season, Madisen and Elizabeth were often paired together during tackling drills as the “girls.” This changed as the season progressed. When the players lined up on the sideline or in a huddle, it was nearly impossible to pick out one from the other. The only way to tell them apart was their body language and numbers, outlined by white on their jerseys. And on Thursdays as they walked from class to class in Clarksville Academy, Madisen and Elizabeth wore their uniforms alongside their team. Even though the two sit together in class, Elizabeth has a different experience from the other players. Classmates sometimes thought a male player who she was dating gave her the jersey. When a teammate said something to Elizabeth or she took a hard hit on the field, she felt she couldn’t cry because she would be perceived as weak. But, after one particularly difficult practice where she again was not able to practice for her position, she got into her mom’s car with tears running down her face. “She was crying so much she kept taking her jersey and wiping her face,” Freeman said. Elizabeth fought to be treated equally during practices and games. 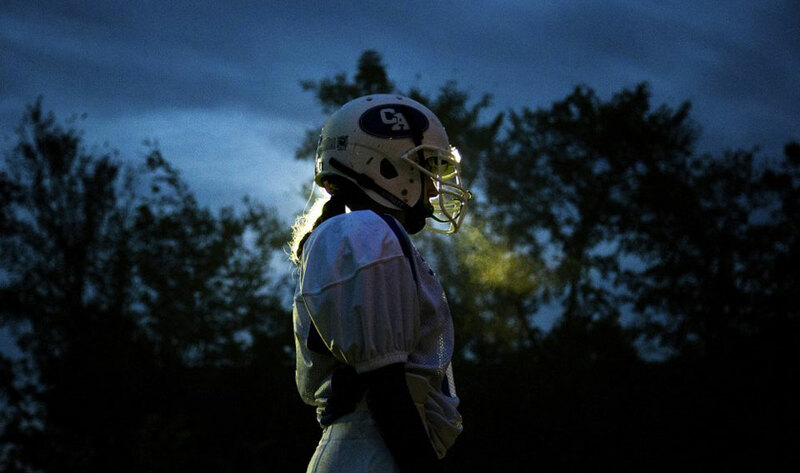 In her three years playing football she has faced bullying and targeting on the field. In some cases, opposing players have ganged up on her and have thrown her to the ground and kicked her after the whistle was blown, according to her mother. Madisen and Elizabeth supported each other and were often seen separated from the team or talking to their friend, the water girl. The two had good relationships with some players and stayed after practice to play and toss the ball around. Ari’s coach, Terrell Jackson, learned a lot having Ari on the team. Ari found a sense of camaraderie and support with the Cowboys. Team members used proper pronouns, danced together during warm-ups and slapped each other’s helmets after a good play. It’s a lesson adults can learn from the kids, according to Sanders. “The way they (the adults) look at gender is probably restricting great students from excelling in something they could be good at,” he said. With more openness in the younger generation, kids feel safer today coming out or taking steps outside of the box. “I feel I’m like everybody else on the team, every other lineman,” Madisen said. Younger people often see breaking gender stereotypes as easier, while parents have made comments and have asked Freeman personal questions about her daughter. Does she identify as a boy? Is she gay? Did you let Elizabeth play with dolls? Does she wear dresses? Why does she have long hair when she likes football? Did you make your daughter play football? Coach Peay said he hoped Elizabeth and Madisen learned the ability to pick themselves up and overcome adversities from their experiences on the team. Despite the struggles, the kids still love it. In October, the three met on one field as the Clarksville Academy Cougars took on the Richview Cowboys. Ari, Elizabeth and Madisen played a long game where the Cougars took home the victory. However, the three players faced off and met that night. The game reunited Ari and Madisen, who took dance classes together when they were younger, but hadn’t spoken since. As the lights turned off one by one, they talked about their experiences on the teams — water bottle mishaps, future plans, coaches and the game itself. Their parents stood in the cold watching them talk like old friends. Still wound up with energy from the game, they joked, completed the drills their coaches had them do at practice, and then raced to see who was faster. “We still shouldn’t be put into the stereotype of whatever gender you are, whatever you go as should be a big deal, because it shouldn’t be an insult that, ‘Hey, you throw like a girl,’” Elizabeth said.